I've made my second contemporary quilt in my Powerline series. The strips for this piece were made during my class with Nancy Crow in October. It was so intensive and we sewed from 7 am to 9 pm every day. This naturally resulted in a lot of strip pieced fabrics. 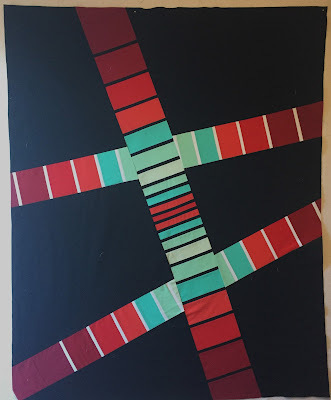 The fabric strips for this piece weren't used in my original quilt (which I later ripped apart). 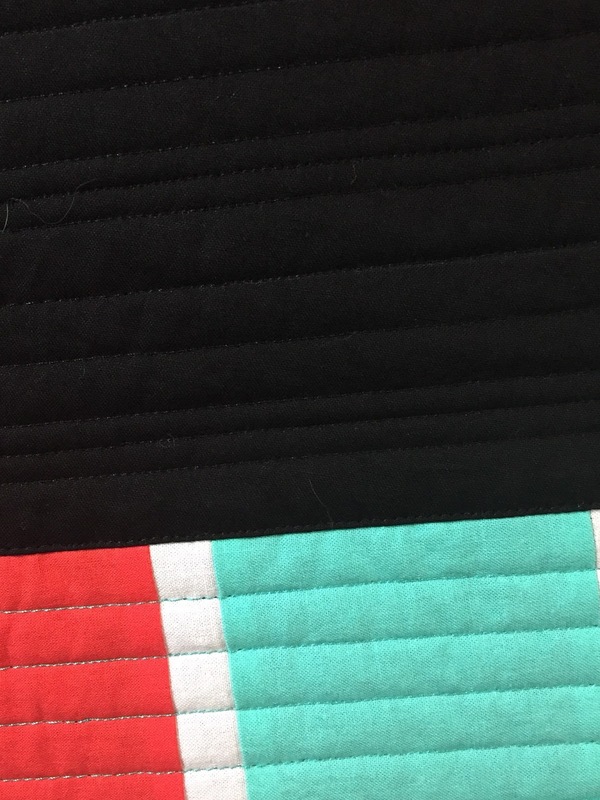 I used to love the combination of turquoise, red, and black ... I guess I still do. You see, I was always told that I was part Navajo. My father's father told the family that he was half Navajo and that his mother's name was "Morning Star". So that made me 1/8 Navajo. If you see me, you would notice my reddish hair and freckles, which is Irish. And it turns out, that is exactly what my DNA test showed. Mostly Irish and British, and no Native American. Well, this came as a shock, so other members in our family took the DNA test too. Then we got an aunt and uncle to take the test. None of us have any Native American. My husband says I should stop liking this color combination and artwork since I now know that I am not Native American. But I do, always have, and probably always will. Sometimes we are drawn to art and colors because we just like them. So there. 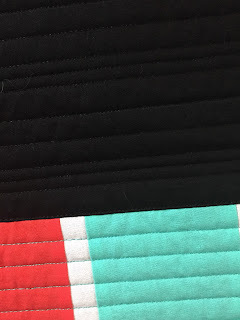 OK, back to this quilt. I decided to make the vertical strip wider than the two horizontal ones this time. Black seemed like the perfect background, so that's what I used. And as a nod to my previous love of Native designs, I used a moccasin themed fabric for the backing. 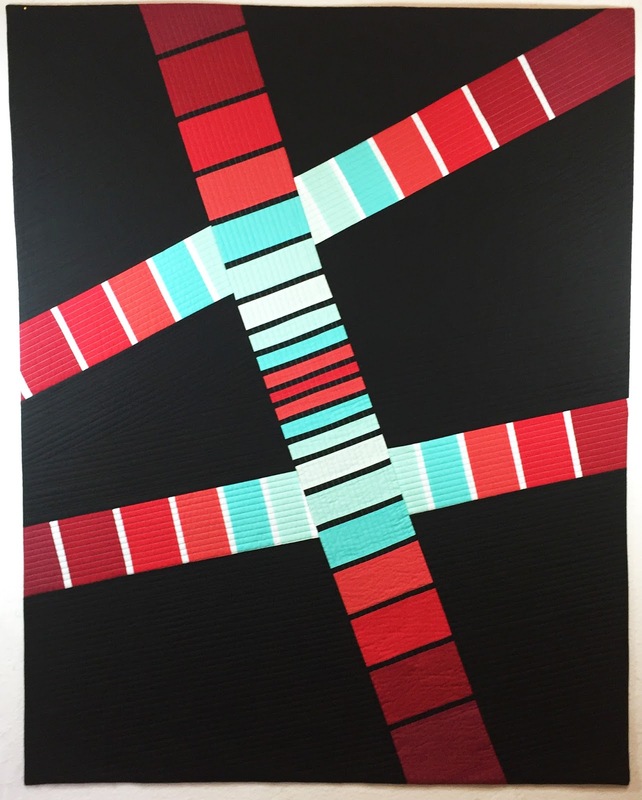 Here it is showing the straight line quilting. It's a little hard to see the black stitching on black, and it for sure looks better in person. I do like it! When I was a kid, I drove machinery under power lines on the farm. Your perspective is right on and it sure brought back memories of a long ago time! Heat Wave - Final - "SCORCHED FOREST"